Rebecca Nole is your typical Riverwester, inasmuch as Riverwesters are not typical people. She was born in the Bronx and grew up in New York City and went to Farello Laguardia High School For Arts And The Performaing Arts. If that sounds familiar to anyone, it’s the school where the movie “Fame” was set. “My dad’s an accountant. He owns his own business. His office is on the seventy-fourth floor of the Empire State Building.” Real estate in tall building got pretty cheap in the early part of the decade, Rebecca explained. Rebecca went to the University of Michigan in Ann Arbor for social anthropology. “I went there because of the interdisciplinary opportunities. It was hard to pick a major, so this way I could design a major based on my interests. It was really freeing. “It was the first time I had a campus – and I fell in love with it. The problem with the urban high school experience, Rebecca recalls, was that it was confined. “I wasn’t allowed out for lunch. I took the subway to school – we lived out in a more suburban part of the Bronx. I was one of a few who had a drivers license at 18 – my parents had cars. “At college, I could walk or bike to class. I lived in a housing co-op on campus. There were two houses in the co-op, Michigan House, the oldest student housing coop in America, and Minnie’s – named after a house mother. So the co-op was called Mich-Minnie’s Empire. I lived in the purple house – Minnie’s. Other co-ops on campus were Robert Owen House, Martin Luther King House, and the Michigan Socialist House. Rebecca is enthusiastic about housing cooperatives – and indeed all cooperatives. “You get back what you put in, both financial and social returns.” Rebecca met her boyfriend in the co-op and traces her closest friendships back to that experience. 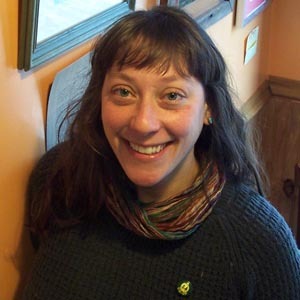 She graduated from college in 2002 but stayed in Ann Arbor and managed a bakery for two years, and was president of the Inter-Cooperative Council for a year and stayed for another year working at the co-op office. Rebecca’s interest in cooperatives continued. Conference She was president of the board for North American Students of Cooperation for three years, and organized the national convention. “When I first got here I worked for United Neighborhood Centers of America (UNCA), an umbrella organization affiliated with Neighborhood Houses. But I decided I wanted to do more direct work. Future goals? “My goal is to create a community so I could be gainfully employed at a co-op.” She has already made a start by taking a lead role in the new Riverwest Cooperative Alliance. With luck for Rebecca and Riverwest, the timing and opportunity will work out so there are more cooperatives for her – and us – to enjoy.